The country of Turkey has many interesting facts to keep everyone intrigued for years. Its historical timeline would make up a full library of storybooks because of the many empires that have ruled the lands over time. The culture, traditions and heritage of many communities within its cities, towns, and villages is also as intensely diverse as it is interesting. Indeed, one would have to explore intensely from the east to the west to gain a great insight into the country. For newcomers or holidaymakers, though, particular facts present a well-rounded impression and for easy reading, we have introduced them in an A to Z guide. Antalya is the second most visited tourist destination in the country, proving particularly popular with Russians, and Germans. Sitting on the Mediterranean coast, its most illustrious claim to fame is as a secret rendezvous point in history for the lovers, Marc Anthony, and the Egyptian queen Cleopatra. They met at the Temple of Apollo in Side, and urban legends say Marc gave the town of Alanya as a gift to his new queen, hence the name of its local beach, Cleopatra's. 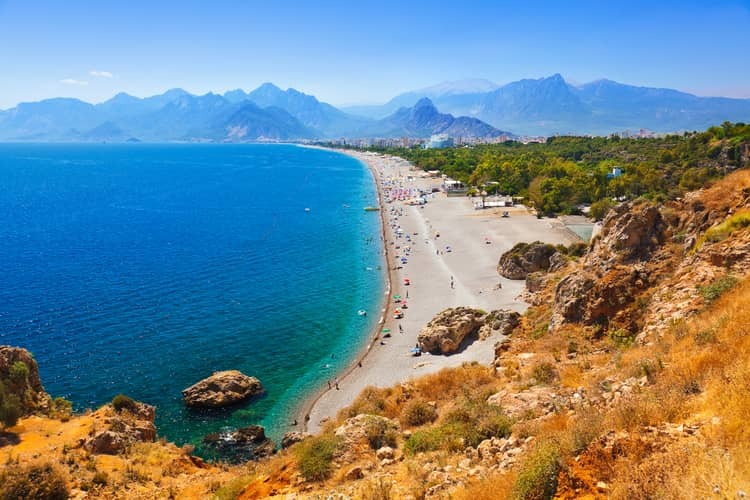 Beach lovers will adore Turkey because the north, west, and most of the south have beautiful coastlines and more than 400 Blue Flag beaches, ranking it fourth in the world. Many say the Mediterranean coast has the best beaches including Kaputas, Patara, Olu Deniz, and Lara. Cultural diversity definitely applies to Turkey with mannerisms, regional cuisines, traditions, and heritage changing from the east to the west. The Laz and Hemsin communities mostly reside in the Northeast while the East is traditionally Kurdish, with many Armenian landmarks as well. Of course, there is the strong historical connection with Greece that stems from the history, ancient monuments, and even the cuisine. It is an overwhelming subject and makes for interesting reading if culture and heritage are your passions in life. Dog experts say the strongest dog in the world originates from the Sivas district of Turkey. Throughout history and even now, Turkish shepherds used the Kangal dog to fight off predators such as bears and wild pigs. These dogs can weigh as much as 80 kilogrammes and reach 80 centimetres in height making them useful guarders of the herd. Europe is not often associated with Turkey, apart from when talking about its disastrous EU application. However, 5% of it belongs to the continent while the rest is part of western Asia. This area is part of the Thrace region, which is southwestern Europe and includes Greece and Bulgaria. Flags are a symbol of a nation’s pride and Turkey’s is no exception. A white star and a crescent half-moon on a red background are widely seen in everyday use as the country’s flag. It is disrespectful to use the flag for any purpose other than displaying your patriotic beliefs. This includes sitting on it, putting it on the ground, or wearing garments showing it. In Britain, we often have the Union Jack on our shorts or bikinis, but in Turkey, this is a sight rarely seen. Geography refers to the landscape of a country of which Turkey has more than 783,000 square kilometres and 7,200 kilometres of sparkling, sandy coastline. It also has 52 lakes and more than 20,000,000 hectares of forestland, of which many are designated natural parks. 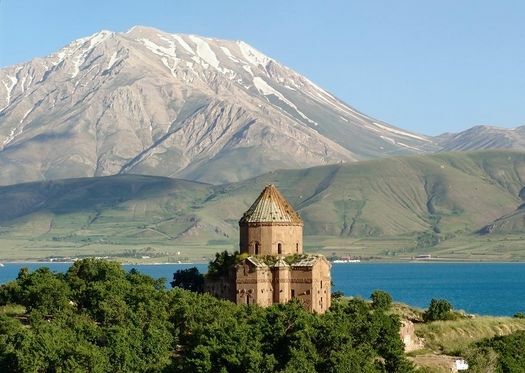 While the central Anatolian region consists of flat plains, it has 27 mountain ranges of which the Taurus and Kackar are ideal for hiking and exploring. What does this all mean? Turkey has some of the most diverse flora and fauna in the world and is an ideal country for exploring the great outdoors! Hats are still popular items around the world, but in 1925, as part of the new reforms for the modern-day Turkish Republic, the new government banned the traditional Turkish hat, also known as a Fez. It was a favourite item of traditional Ottoman attire, but these days, shops mainly sell the red felt hat with a black tassel as a souvenir. Istanbul is Turkey’s largest city. With a population of roughly 14.8 million, it is also the central hub of the country for business, finance, transport, education and the top visited tourist destination. In 2014, it achieved international status as the sixth most widely visited city in the world, nearly ranking up with the likes of Milan and Rome. Jewellery is big business in Turkey, but especially in the Grand Bazaar of Istanbul where artisans they still make rings, necklaces, and bracelets by hand using age-old techniques. Turkey’s claim to fame though is home to the world’s fourth largest diamond. The spoon maker’s diamond at an astonishing 86 carats sits within guarded rooms at the old Topkapi Palace in Istanbul. Konya in the central Anatolian region of Turkey was home to one of the world most famous poets. Born in the Persian Empire in 1207, Rumi settled in Konya to dedicate his life to the sect of Islam known as Sufism. Known for his wisdom and deep understanding of human emotions and feelings, by the 20th century, his work had been translated into hundreds of languages and sold all over the world. He is also the best-selling poet of all time in the USA. His tomb is in Konya in the Whirling Dervishes Museum. The Language of Turkey is Turkish, and it is phonetic so is pronounced exactly how it is read. The alphabet consists of 29 letters of which seven do not appear in the English alphabet. The letters Q, W and X do not appear in the Turkish alphabet. Money makes the world go around and before 2005; everyone in Turkey was a millionaire thanks to the inflated zeros on the currency, but this all changed when the government introduced the new Turkish lira. Bank Notes are in the denominations of 5, 10, 20, 50, 100, and 200 liras. 1 lira is a coin as are 5, 10, 25, and 50 kurus. Natural resources are in abundance in Turkey, and it is one of the few self-sufficient countries in the world. Its most abundant natural resources are coal, iron ore, copper, mercury, and gold. Ottoman history is an integral part of the country because the empire ruled from Istanbul for more than 450 years. 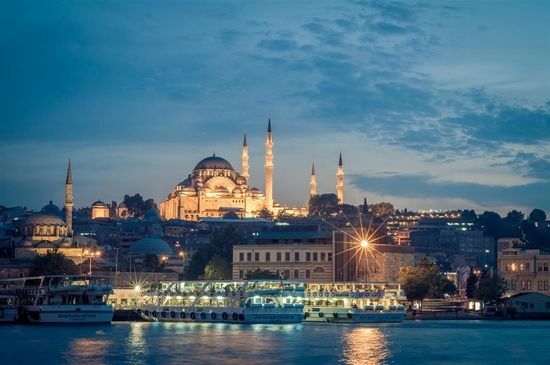 To understand facts about the Ottoman history of Turkey, it is worth visiting many of their landmarks throughout Istanbul including the Topkapi and Dolmabahce Palaces, the Blue Mosque, and the Grand Bazaar. The Population of Turkey is just over 79 million people. This makes it the 19th most populated country in the world. This does not include the foreign expat communities that have settled mainly in the coastal resorts of the Aegean and Mediterranean areas of which many are British, Russian, and German. The Religion of Turkey is Islam, but many first time visitors are pleasantly surprised to learn that the beginnings of Christianity also stemmed from this country. That is why faith tourism tours are increasing in popularity. The Seven Churches of Revelation as seen in the New Testament of the Bible are all in the Aegean region, while in Cappadocia, the top tourist attraction is the UNESCO Goreme Open Air Museum and its ancient rock-cut cave churches. Surnames became legal in Turkey in 1934. Before that, Muslims often used titles depending on their social standing. These days, titles are still commonly used but in a different context. For example, “arbi,” or “abli,” refers to a male or female that is older and highly respected. Two males may also refer to each other as kankar or kardesim depending on their close friendship. Time in Turkey became very confusing in 2016 when the Turkish government abandoned daylight savings time. Therefore, from March to November, Turkey is ahead of Britain by 2 hours but ahead by three hours in all the other months. This is worth remembering if you are travelling at those times of the year, so you do not miss your flight! 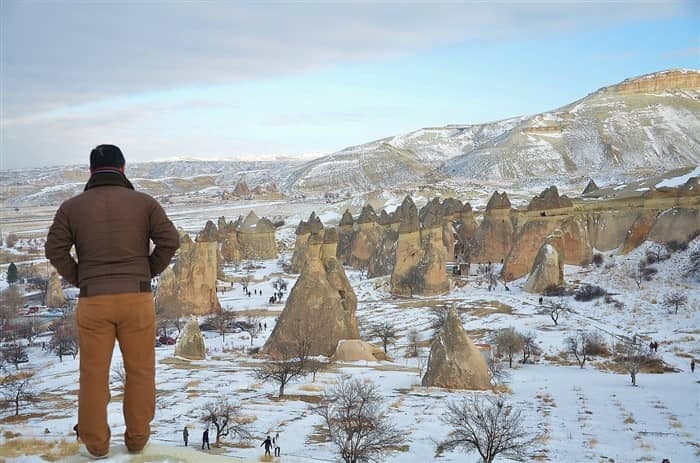 Underground cities are a focal point of the central Anatolian region of Cappadocia. Used throughout history as defensive mechanisms against invading armies, many of these ancient cities have been excavated and open to the public. No one knows the exact amount, but to date, 37 have been uncovered, of which the most famous is Derinkuyu. Van in the eastern half of the country, on the border with Iran, has three extraordinary claims to fame. It has Turkey’s largest lake measuring 119 kilometres at its widest point. The rather beautiful white Van cat is renowned for its different coloured eyes of blue and green and citizens always say the best breakfast in Turkey comes from this region. Weather conditions in Turkey are unique because the country has three different climate zones. That is why people visiting Mount Tahtali in the winter smile at the slogan of skiing in the morning and swimming in the afternoon. Likewise, during June, hundreds of people are sunbathing in the Mediterranean and Aegean coasts while in the northeast they are wrapping up warm. Skiing resorts in Turkey are also raising their profile thanks to snowfall that makes the ideal conditions for the sport. Xmas is not celebrated in Turkey, although Christians and expats in the country will hold their own private events. You may still see replicas of Father Christmas in shopping malls, though. This is because he represents Noel Baba that is the Turkish version of Santa Claus and widely seen at New Year which is celebrated throughout the country, not for religious purposes but purely commercial. Yoghurt is one of the most commonly consumed food items in Turkey. Turks will eat it alongside their main meals, and it is the main ingredient of Ayran, a widely popular drink of yoghurt, salt, and water. Many Turks believe Ayran is the perfect cure for hangovers and tummy aches. Zeybek is a collective group of roughly 150 traditional folklore dances stemming from the western Aegean region. Instruments used to play the music of Zeybek dances are the clarinet and drum. 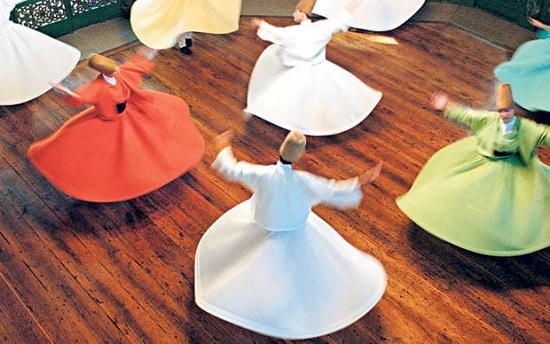 Each region has a different style, and the pace varies, but the chances are that if you go to a Turkish night in your local bar, locals will highlight this age-old form of dance.